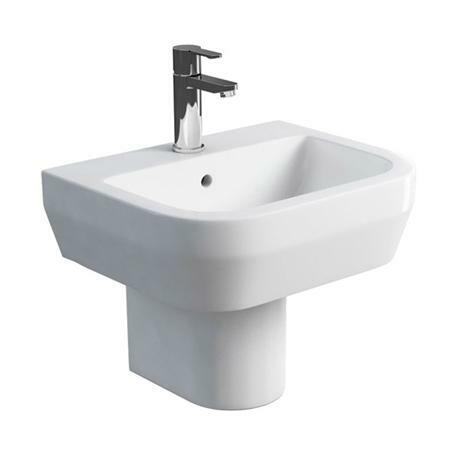 The stylish Britton Curve wall hung washbasin with round semi pedestal, with its modern simple clean design and modern semi pedestal would make a great addition to your bathroom. Washbasin has 1 tap hole and is available in two sizes. The wall hung option is perfect for modern bathrooms, cloakrooms or en-suites where space is at a premium. Manufactured from high grade materials this technologically advanced range is engineered to be completely modular. The Britton Curve collection will bring a touch of style and luxury to any modern bathroom. The range includes a selection of Back to Wall Toilets and Bidets, Wall Hung or Floorstanding options available - Allowing your bathroom to have total co-ordination. All Britton Bathrooms pottery is covered by a 25 Year Guarantee. Use in conjunction with Britton's excellent range of stainless steel and ceramic bathroom accessories (sold separately) for the complete contemporary bathroom.